I've been told before, both in hearsay and to my face, that I have a "perfect life." For all I know, some of you are nodding your heads as you read that, as you hold the same belief. 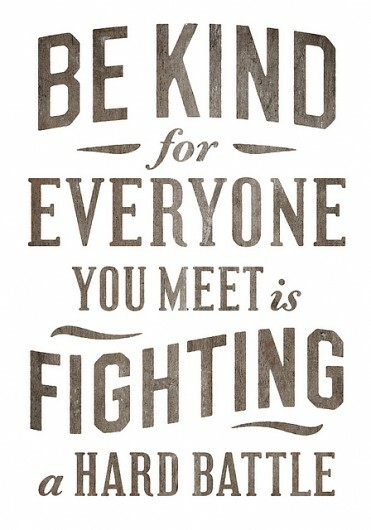 Just try to remember, that no matter how honest someone is, wholly be kind to them. You do not know the groanings of their heart or very real fears and limitations, and it's not up to you to minimize their "perfect life" to finally accept that they may not in fact have a perfect life. I've been told that blessings come to me too easily, but thankfully I also carry the pain of a miscarriage to mar the perception and bring me back to regular personhood. It shouldn't have to come to that. Our lives, are our own. At best, our attempts are feeble to convey the inner workings of intimate relationships of spouses and families, let alone the delicate balance of loving ourselves. Don't wait until you finally understand what a person's burden is, just give them the benefit of the doubt that they have a struggle, everyone does. I do not live a perfect life. But I also have not always given others this same consideration. It is a great reminder to us all. And I must say, I don't see how anyone who reads your blog would think your life is perfect. Yes, you are extremely blessed, but you've shared many struggles on here too. Strange. I love that saying. I'll be the first to admit, it's sometimes hard to think that way about someone, but it's true. I'm sorry that someone (or many) have said those things to you. I agree with Kristal, you have many blessings, but you've also shared hardships. We all have our blessings and we all have our hardships. Did someone comment something nasty to you, lady? This is a great reminder but I hate that you even have to post it. I'm with Kristal---you are usually pretty honest and not always 'puppies and rainbows' so I don't get why anyone would say you have a perfect life. I've had to remember it a few times lately when I've been hurt by close friends. So many times it's issues they are dealing with internally, and come out in this outward hurtful way. And learning to be quick to forgive is something I'm still working on! And, ditto to Kristal. My first thoughts exactly. I love this so much, Leah. And I love your heart, your honesty, your love for your family, and your commitment to writing the truth in love. I totally forget sometimes that even when people LOOK like they have it all together, no one does. Not really, not 100%. Good reminder. Good reminder, friend. Hope no one is picking on you. Have a good weekend, enjoy your extra hour of sleep (hopefully)! I am a bit late to this as I have been engaged in my latest battle (back surgery for husband) but this really hits home today. A week ago we feared the hurricane bearing down on us. Today we are safe....but so many are not. So many! Thank you for reminding me that I am one of many struggling with personal battlefield.